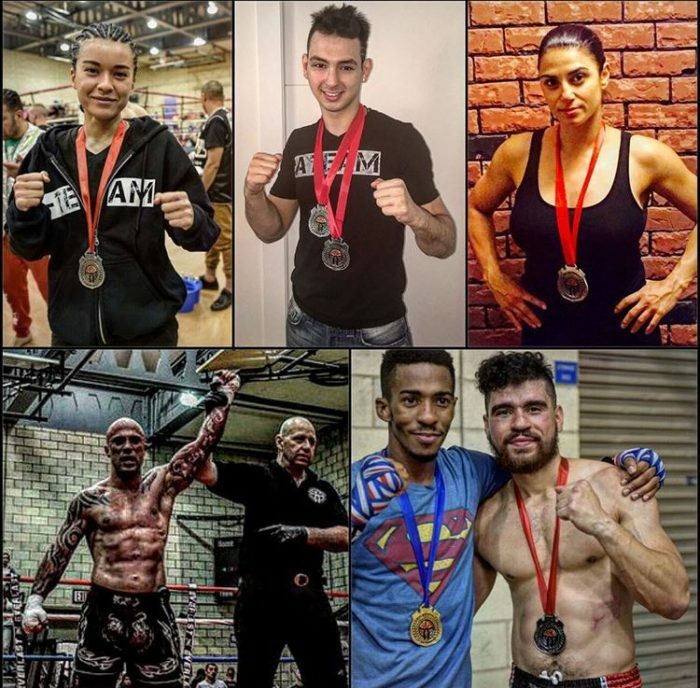 This year has been an incredible year thus far for all of our AMAA students and competitors. 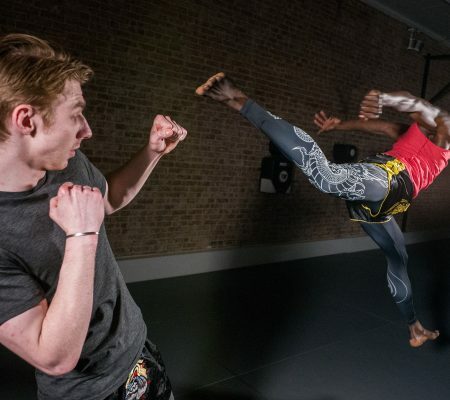 While we often fill our weeks and weekends with smart training, guest instructors including countless MMA, Muay Thai, Brazilian JiuJitsu, Jeet Kune Do and Kali legends, seminars and free workshops, we also have the great opportunity to help some of our students fullfill their competition goals. 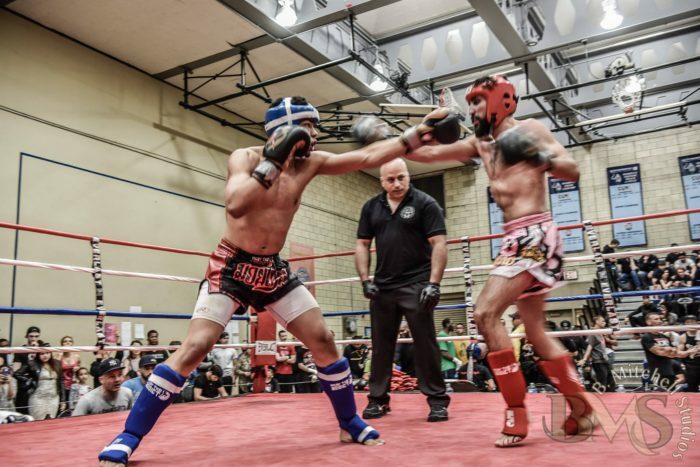 This past weekend was the annual WKA USA National Tournament. An event that the A-Team has been preparing for for over five months. 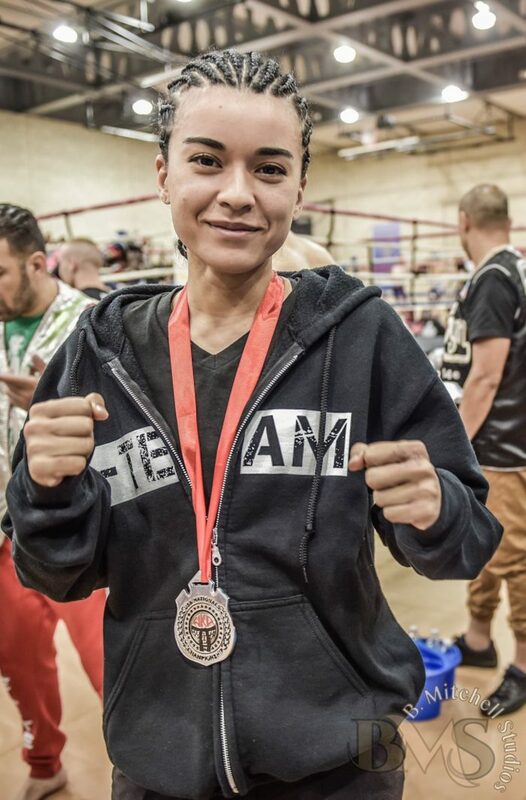 Training for the WKA tournament started in January. 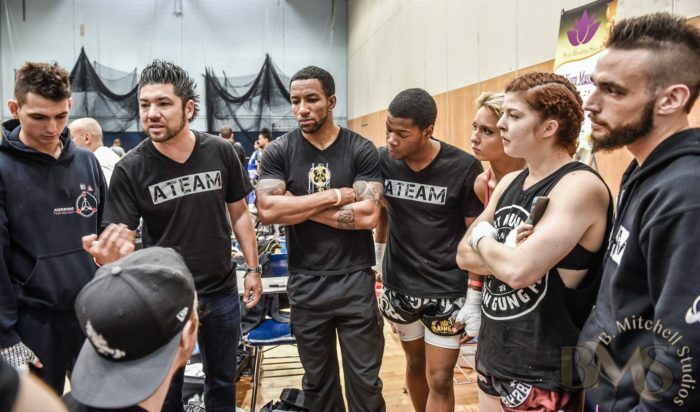 One of the things that most surprised people when they asked about this tournament was that we went as a team, rolling 16 fighters deep, six coaches plus the Ateam crew. Do all students compete at AMAA? Absolutely not! 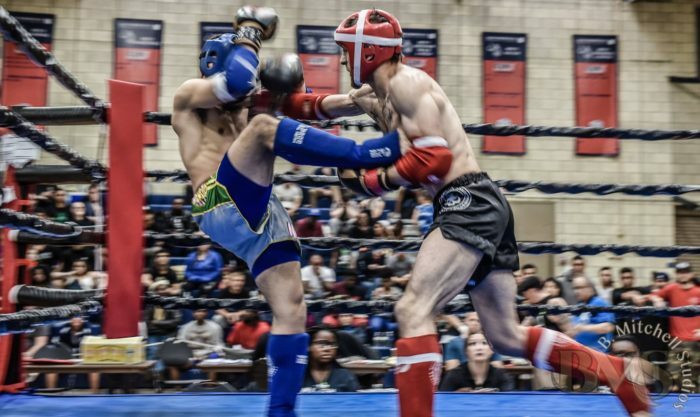 We do have students that typically fight for the Academy, and others that had a competition goals to fulfill, but generally out student base is highly diverse, and just a small population has goals of fighting in the ring, cage or on the mat. 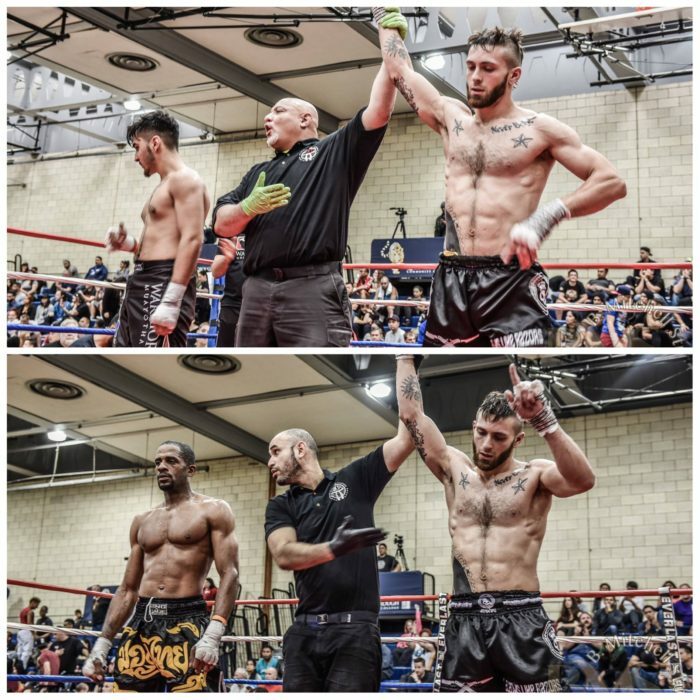 This weekend however was a great opportunity for many of our students to step in the ring and compete in Muay Thai, Kickboxing and MMA (Mixed Martial Arts). Anderons is a team, a family, a community, a home— past fighting, we are a real team, a team that helps one another grow inside the Academy. And this weekend we came together as a team with coaches and assistants and teammates all helping each other get better and improve, and all there to cheer their teammates on when it comes to competition time. 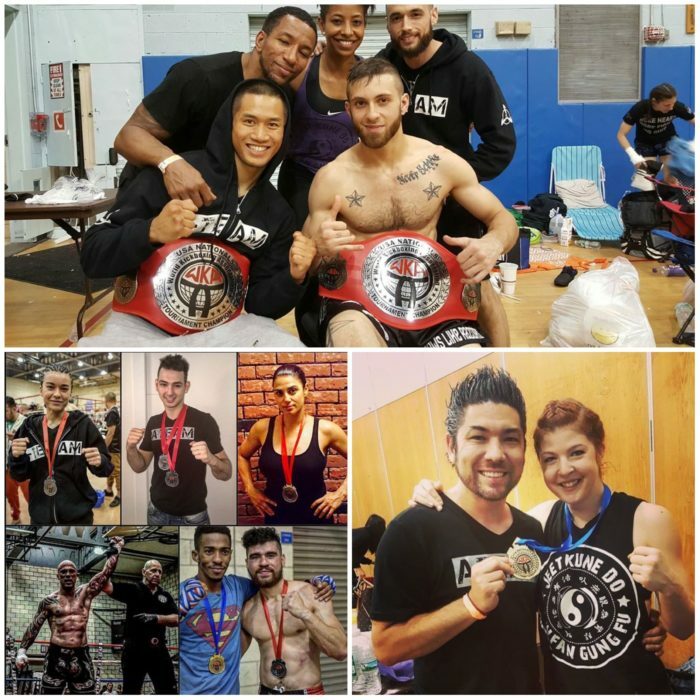 Over all the #ATeam took home Two WKA Open Class Title Belts (one in MMA, the other in Glory Kickboxing), one Gold medal and 8 Silver medals. Plus, a whole lot of incredible memories and experiences. 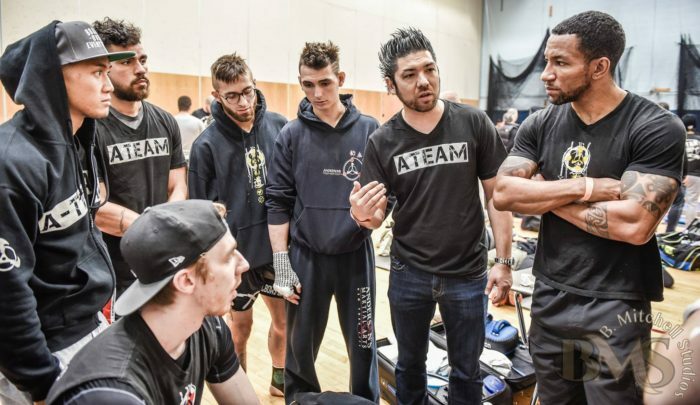 The training was challenging, as each competitors attended a special ‘Competition Team’ training hour every single Tuesday, along with that they barely ever missed a scheduled AMAA class, and they also adhered to a rigorous lifting, stretching and nutrition program provided by the ATeam staff. 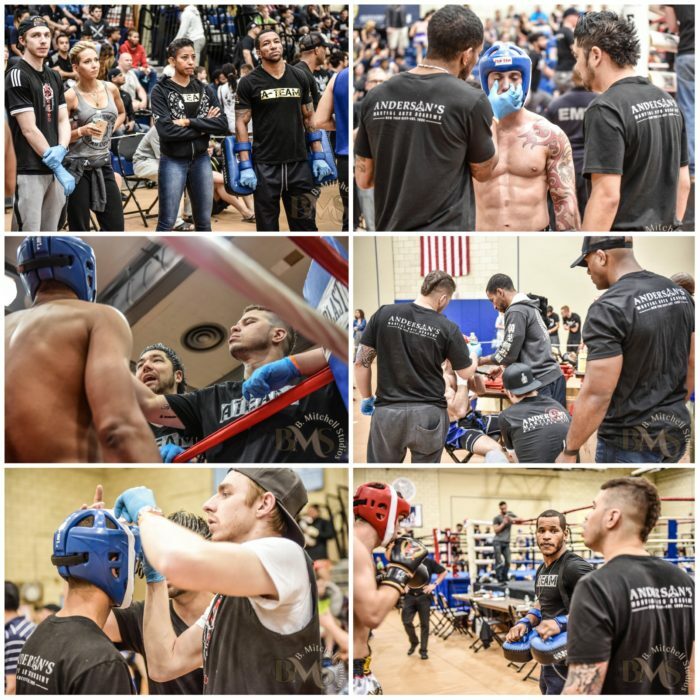 Throughout the five months many AMAA students helped the competitors by holding pads, isolating drills and simply encouraging the fighters. 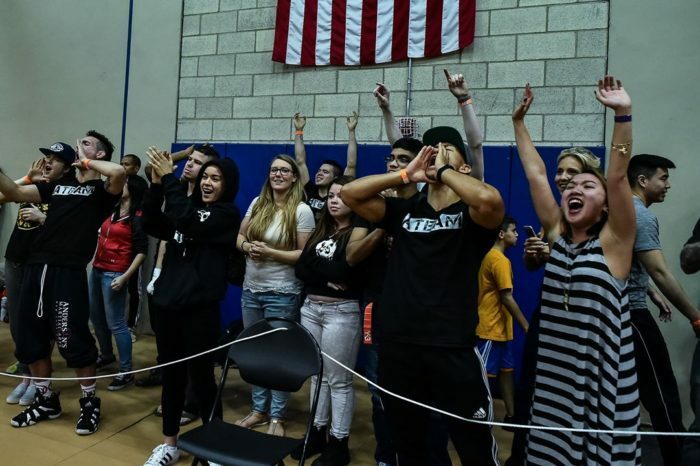 It was truly incredible watching everyone come together in a set of goal and help so many dreams become a reality. The weekend was broken down into four long days. First, of course where the Thursday weigh-ins, where every team member had to make sure that they made weight. 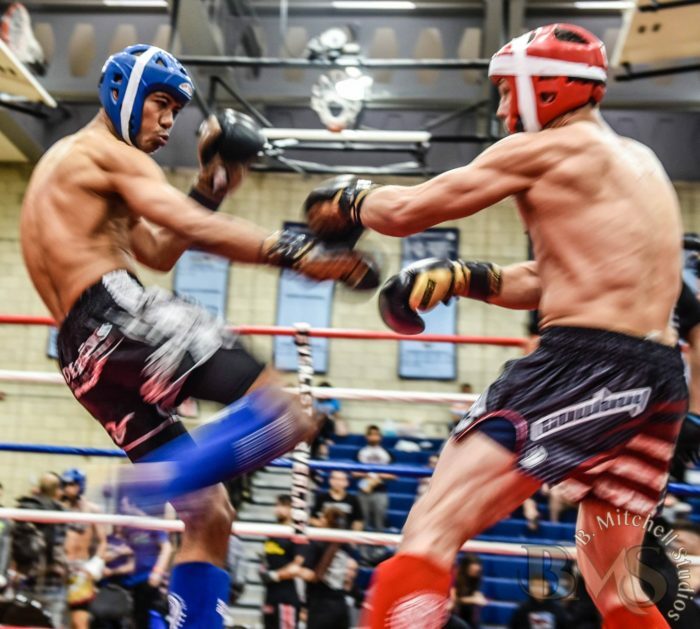 Day one of WKA started off with a bang. Then came Friday, the day the actual competition was to start. 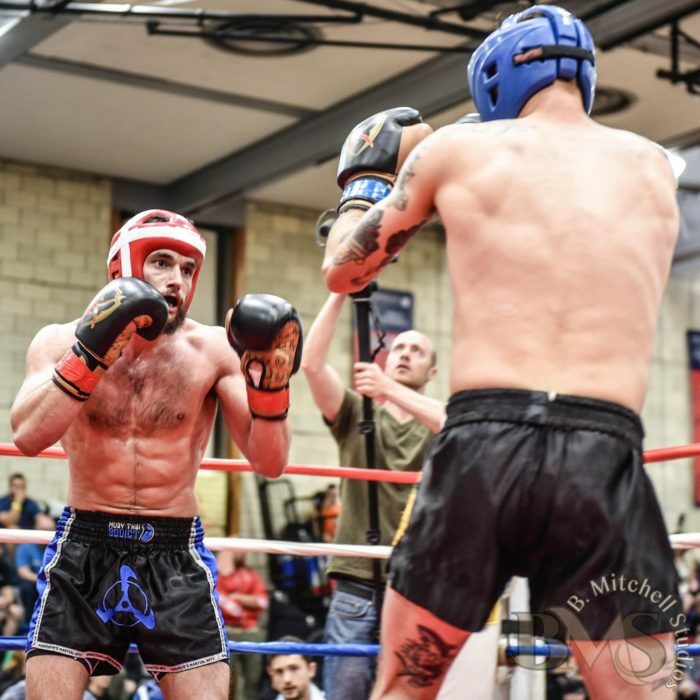 First up, after a long while of waiting was Anthony Fontana, this was Anthony’s first ever fight in the ring, but he has been training at AMAA in jest Kune Do, Kali, Muay Thai for almost eight years. 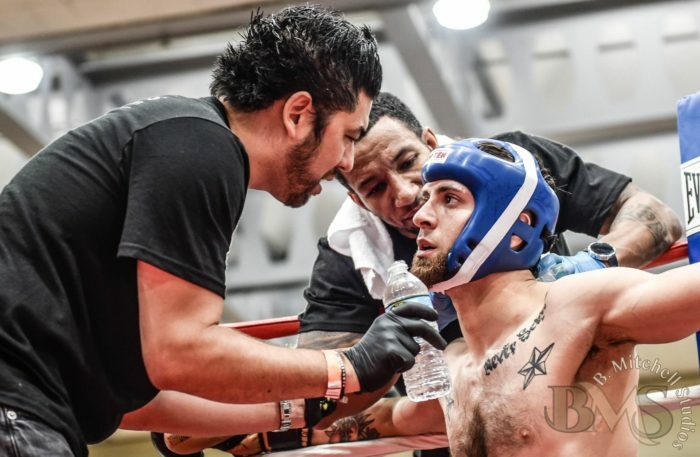 Anthony Fontana went in and truly set the pace for the entire ATeam as he won the fight in a wonderful performance. After some waiting the next one in the ring was Daniel Ramos, who won his match in a solid victory, this was Daniels first time in the ring as well. 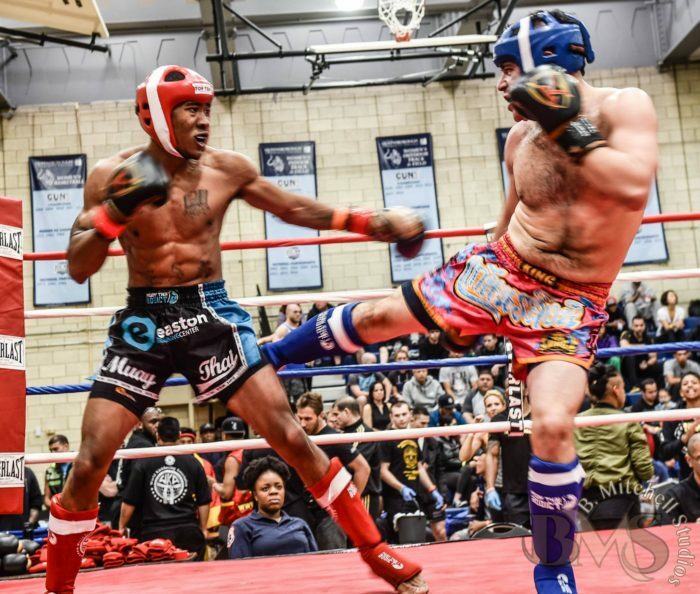 To continue the day young Eric O’Bryant went in to the ring, and while he lost his fight by decision, he put on a truly great performance, showcasing his skill and hard work against a far larger and more experienced fighter. 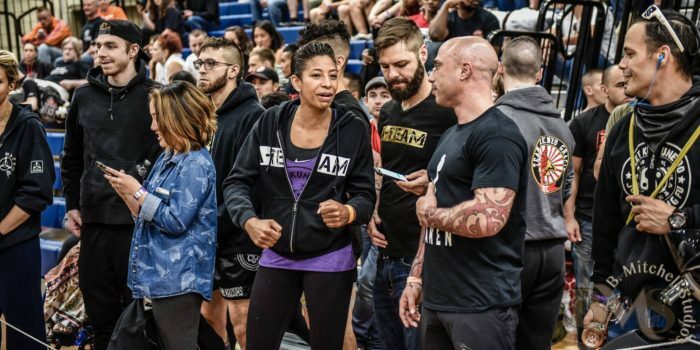 Suddenly, we began to see more and more Anderson’s students (family members) fill the stands, coming in to support their fellow training partners. 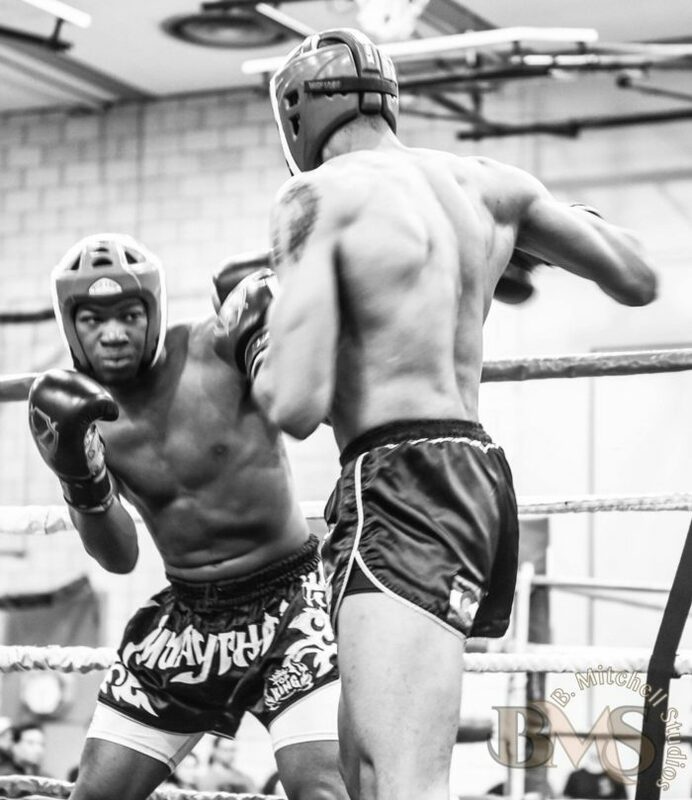 Zulu Williams was up to fight soon enough, and while showing a wonderful performance, he did not take home the win. 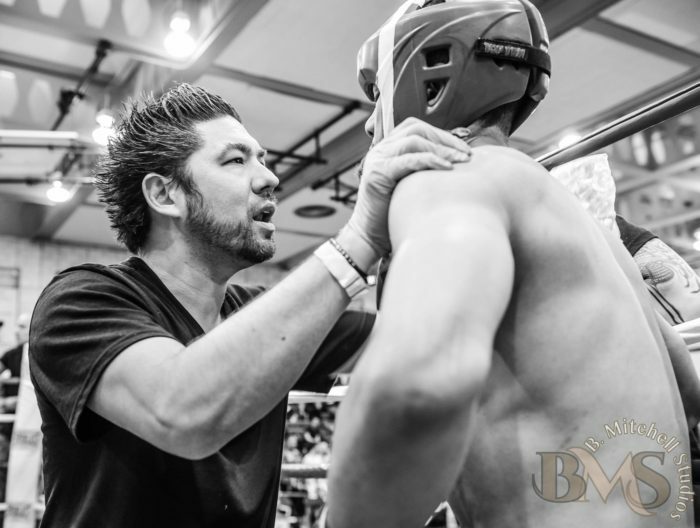 Next up in the ring was Johny Pina, fighting in the more advanced ‘open class’ divisions in both Muay Thai and Kickboxing. 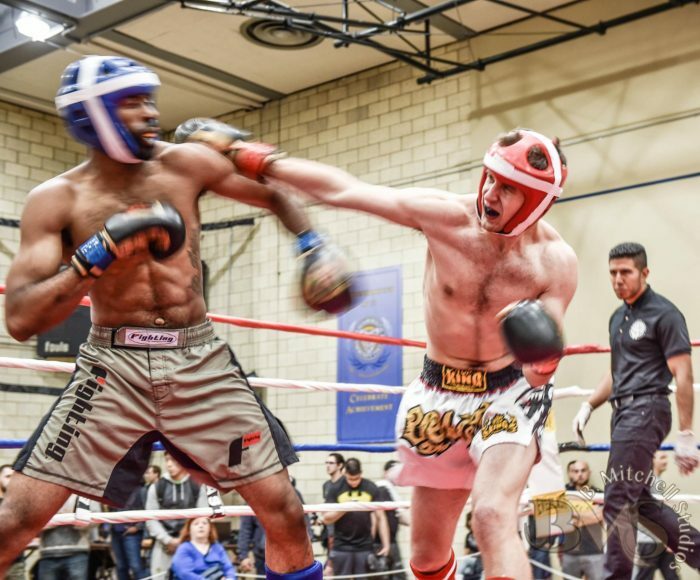 John took to the ring and won the fight in a dominant decision. 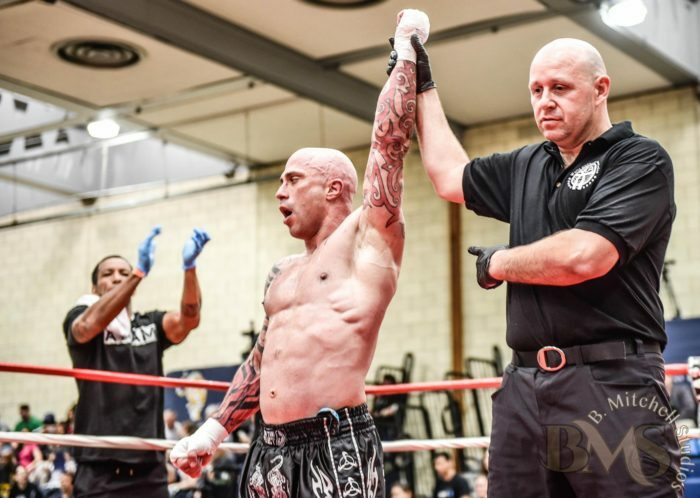 And, only a few minutes later was called into the ring again, where he fought and won his second fight of the weekend by a referee storage (TKO) with an elbow. Day one was complete, and everyone headed home, knowing that day two would start early. Day two of the WKA started with coffee and anticipation, the team piled into the large courtyard outside the arena and waited to get in and set up for day two. 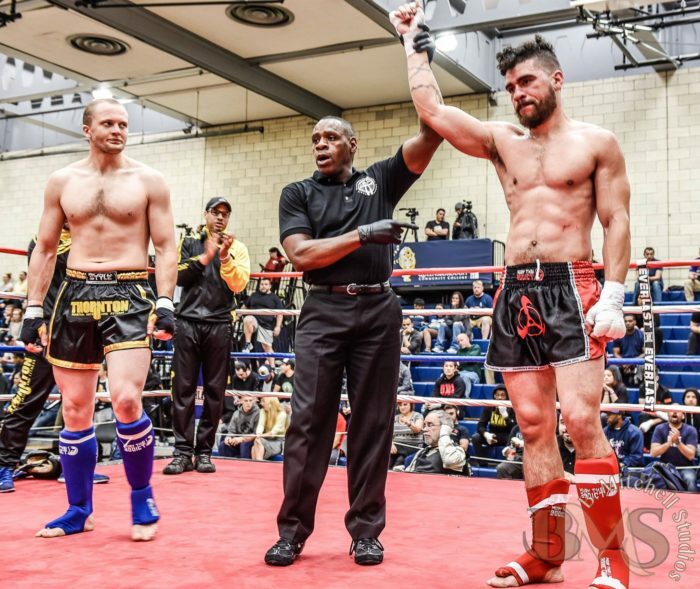 Max, Jeff and Sam were up next, all of them where fighting for the first time ever, and very one of them had more experienced opponents. Max Talbot went out and fought a very close fight, he did not get the win, but his performance against a larger and more experienced opponent was awesome. Jeff Rose fought next, again, facing a more experienced opponent, he performed very well, and left his team and coaches proud. Finally, Samuel Tapia went into the ring. 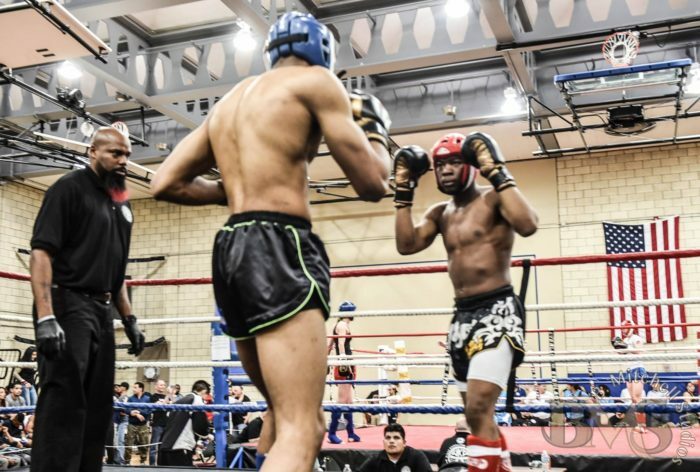 His first round was a tough one, and yet, somehow he had the nerve and the guts to bring a very serious and very skillful fight to his opponent in the next two rounds. The fight was close, and many believed that Sam took it, but more then that, his heart and his fight inspired everyone in the audience, and it was beautiful to watch. Needless to say that Dina Tarrab dominated a strong opponent and took the win to finish off the second day. Day three of the WKA was a mad dash, we still had fighters that hadn’t fought yet, and others like Daniel, John, Dina waiting for the finals. Still waiting for the open class and MMA divisions were Jon Bianco, Nate and Alex. 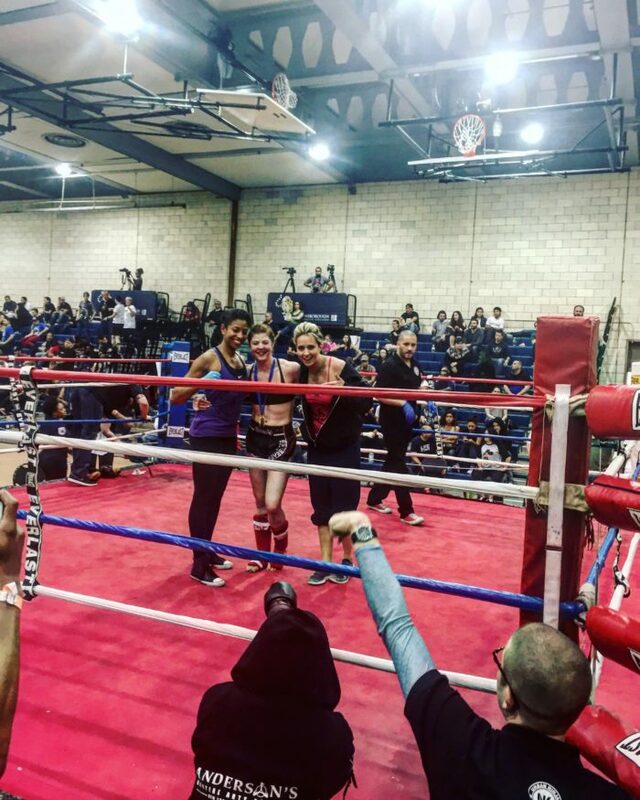 But, first up in the ring was first time fighter Addie Fasel, we took the first win for day three win in a very dominant performance. 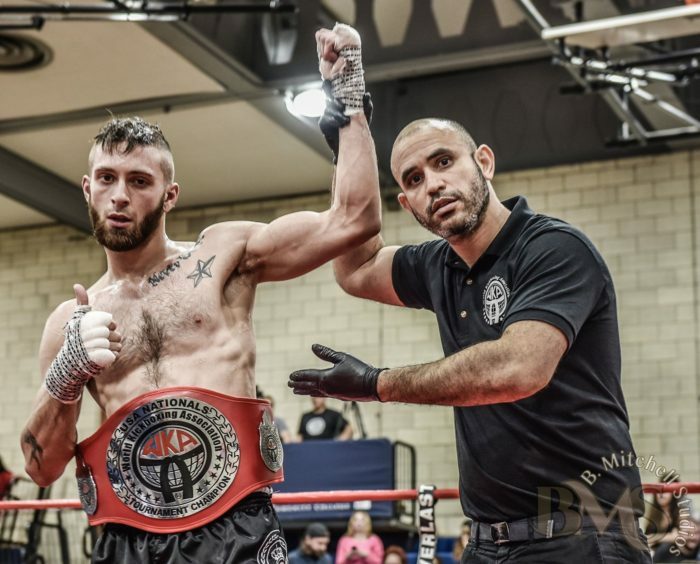 After that Jon Bianco got advanced to the finals in MMA, and was told to gear up for his Glory Kickboxing Open class fight. John did not win that fight, but again, he showed a wonderful performance in the ring. 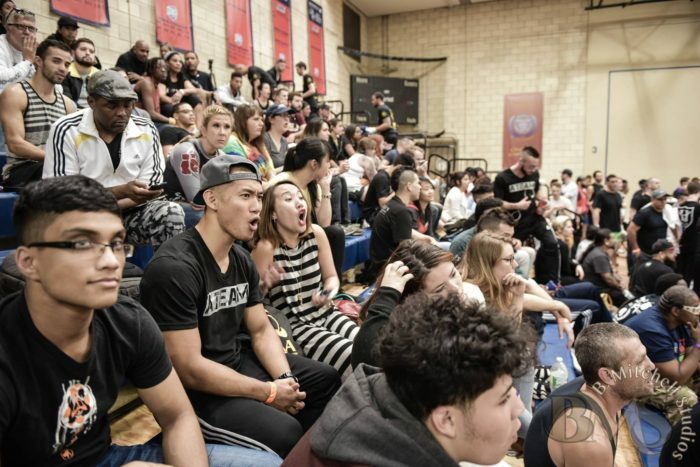 Then it was hates turn, finally the MMA (Mixed Martial Arts) Open Class division was up. 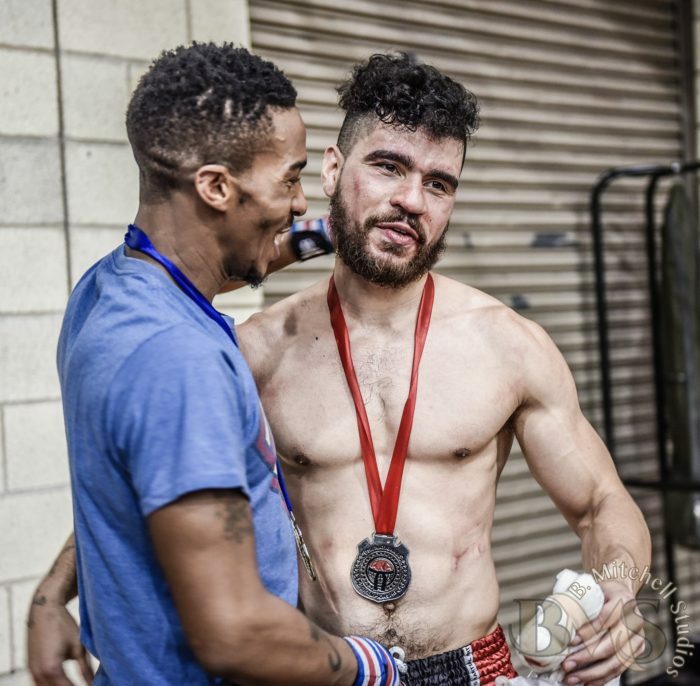 Soon afterwards, Daniel Ramos was up to fight again, and while he did not win the gold, he did take home the silver medal (not bacd for a first go in the ring, and two very impressive fights in the WKA). 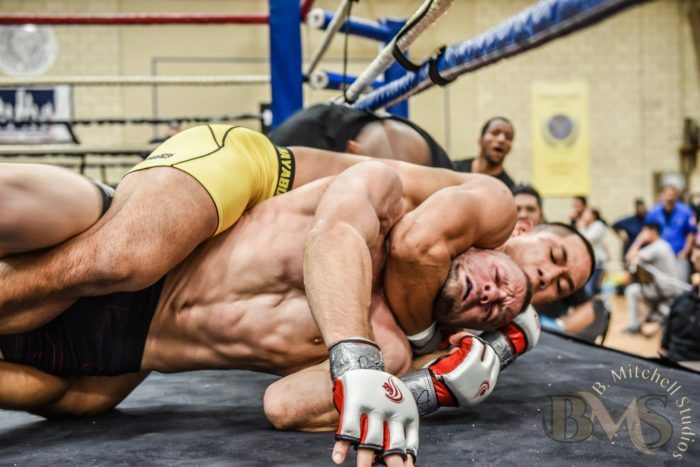 Finally Johny Pina had another fight (his fourth), which he won, with only one left to take him to the belt. 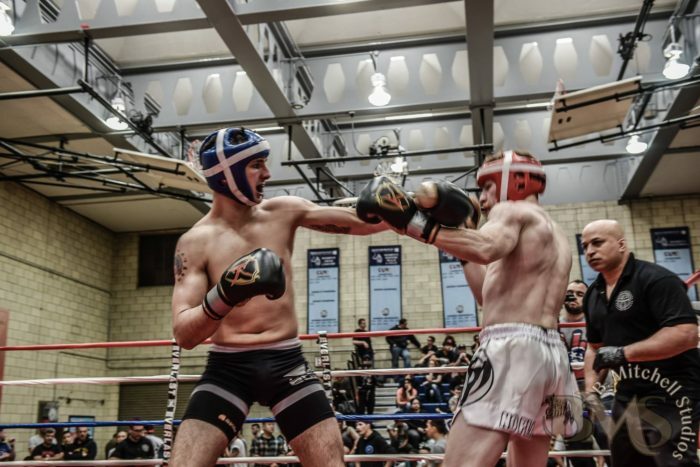 And, Eric O’Brian and Arie Leon fought, both fighters lost, but showed a great deal of heart and skill. 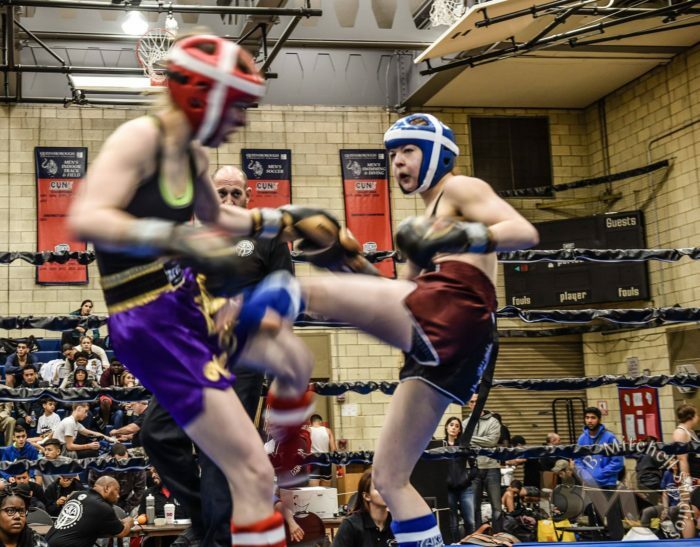 Finally Addie was up for her final fight, the fight for the gold medal, which she clearly won agianst another very tough and skilled opponent. Adidas performance in both of her fight truly inspired the entire team, and as she was awarded the gold medal everyone cheered. 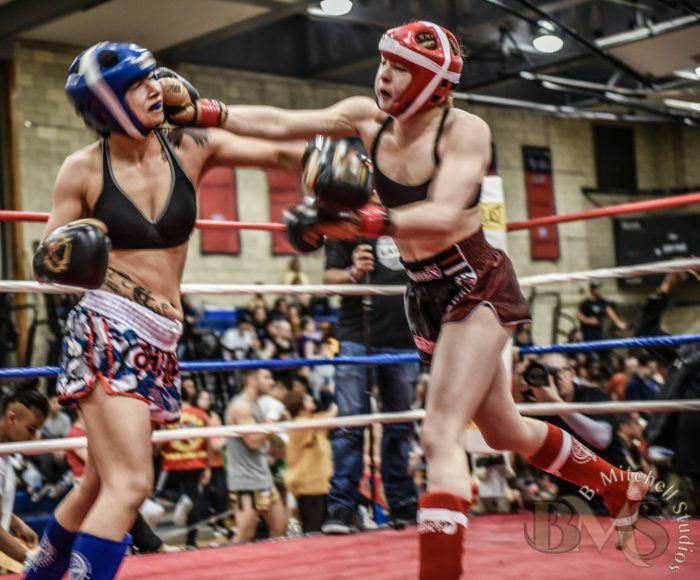 And then, shortly after, Alex Zavlunova entered the ring, for her finals fight in the Muay Thai Open Class division. Alex put on a great effort and the fight was very close, but unfortunately she lost and took home the silver medal in her division. 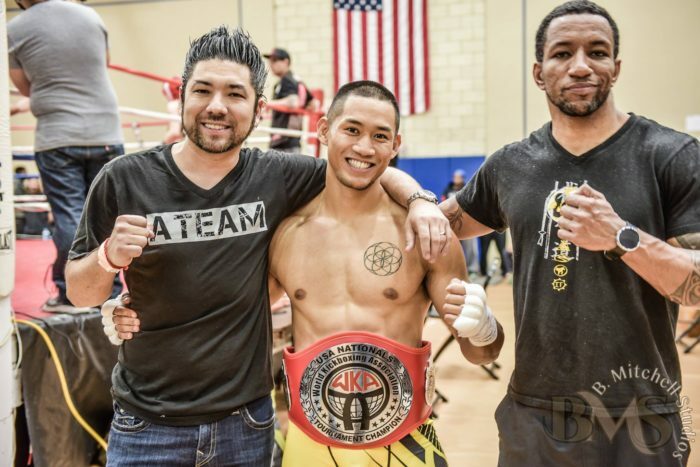 And to finish off the weekend Johny Pina had his last bout of the night, winning the matcha nd taking home the WKA Glory Open USA Belt, a second belt for the ATeam that weekend. 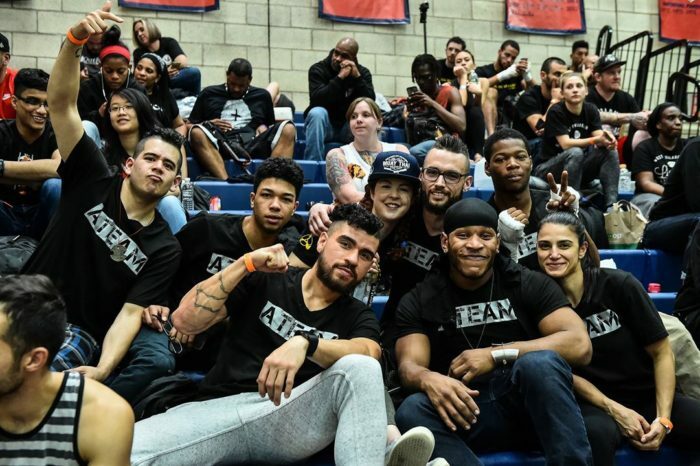 A HUGE thank you to everyone who competed, and also, the amazing coaches, training partners and students who support all of our students and fighters in all areas of martial arts and in every goal. It was a grueling 3 days, waking up at 6 am and getting home at 10 pm or later, but the A-Team stuck together like a family and made it all alright. 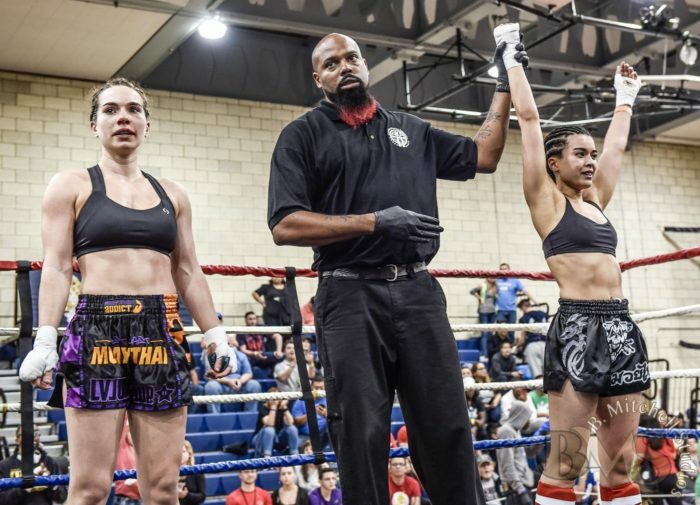 And the biggest thank you to Natanya Mitchelle, who helped organize the weekend, keep track of the fighters and who also took all of these amazing pictures. And to Brian Crenshaw for putting together an amazing competition (as always). 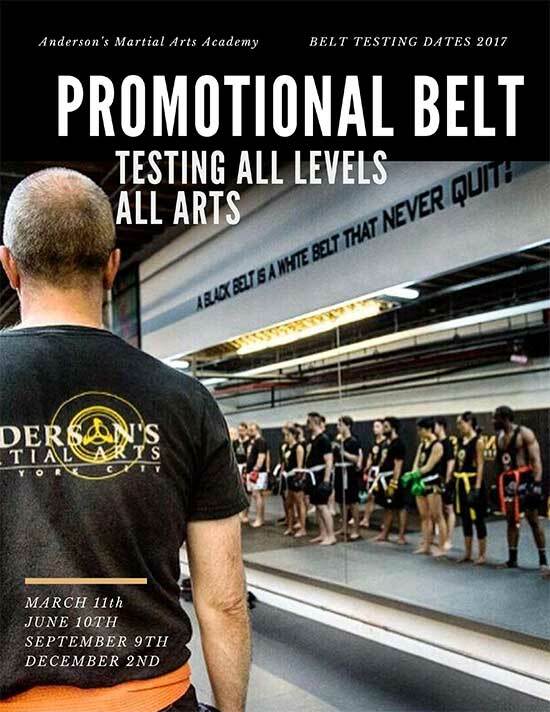 and finally, as always a gigantic thank you to the person that created this community, opening his first school, Andersons Martial Arts Academy to the NYC public in 1996, we also want to thank Sifu for bringing us all together, and for uniting the #Ateam, for living out his dreams and his vision, for building a strong foundation for anyone that enters the AMAA doors, with any goal – always and forever. 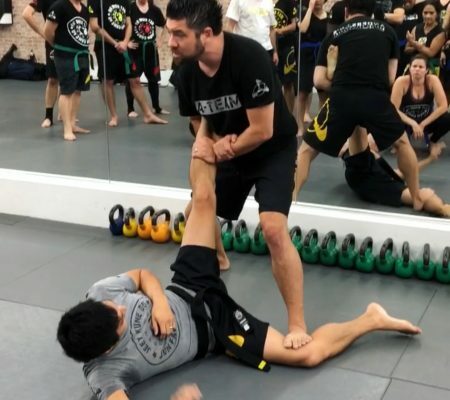 As always AMAA makes it a priority to expose our students to some tremendous opportunities to fulfill their goals and dreams and to train with the worlds leading martial artists in Jeet Kune Do, Muay Thai, Kali (Filipino Martial Arts), Brazilian JiuJitsu, Silat,Boxing, Wrestling, Sivat and so much more. Not a student yet? Thinking about checking us out? 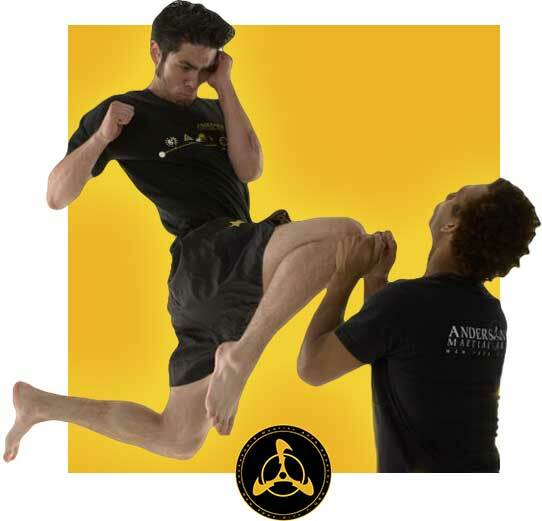 email us here or give us a call to get a free trial week, or a free one-one-one private lesson and see if AMAA is right for you.